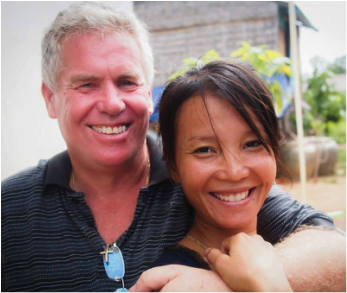 The Manna4Life founders and leadership team are a Christian couple, consisting of a local Cambodian woman, Leakhena Plan Knight, and her Canadian husband Kevin Knight. In May 2011, they formed Manna4Life, a Cambodian NGO. Although Kevin is a foreigner, the NGO was started as a Cambodian NGO intended to be fully run by locals in the near future. Kevin was interning with another NGO called Servants in January 2009, when he came in contact with the injustices surrounding land grabs and the threat of evictions on the Dey Krahorm community. Kevin was there as a human rights observer to witness and comfort the community which was violently evicted form their homes. Kevin's internship lasted three months at which time he was required to return to Canada to complete the internship. Upon completion, Kevin returned to Cambodia full time, searched out the community which was now located in Oudong, 38kms from the city. Leakhena, who grew up in poverty herself, gave her invaluable insight into the struggles and injustices of the poor. Being Cambodia herself, she has a true understanding of the needs and culture of the people. She has had considerable experience working for NGOs, Including World Vision, Precious Women, and Develop Our Village Economy (DOVE). This gave her the proper training allowing her to embark in starting her own journey, specifically, for the Tang Khiev community. Manna4Life is currently managed on the ground, in Tang Khiev, by Kevin and Leakhena, and provides employment for a staff of 22, one director, one school principal, 10 teachers, five teacher assistants, three cooking staff, one social worker and one computer teacher. This team is supported by administrative volunteers in Australia and Canada. Living within the community, Manna4Life is an organisation that truly understands, and shares, the hopes and fears, joys and disappointments of the people that they have set out to assist. By entering the community as keen “learners” rather than someone possessing all the knowledge and solutions to the communities issues, Manna4Life aim to empower the local people to direct their own, sustainable change.